GET READY FOR FACTOR X ! ! ! Neither strictly roots nor exclusively dance-hall, the repertoire of Factor X rides on the new wave of French-language reggae. Through contemporary riddims - urban versions of the classic Studio One sounds - she delivers a clear and strong message… and she’s not shy of a few gags. Anne Factor X Michalakoudis, one of the revelations at the 2003 Reggae Geel festival, learned the ropes as a background singer with her sister Mika, appearing both locally (Maartrock, Gentse Feesten…) and internationally (Rototom Sunsplash, Reggae in Budapest…). But it was after being inspired by the outstanding musicians she met in Jamaica (Black Uhuru, 809 band and Chalice) that Factor X decided it was time to go solo. Back in Brussels she hooked up with The Right Prophecy, one of Belgium's first truly Jamaican-style ventures, and recorded a few ragga versions of classic Studio One riddims. The tone was set immediately: catchy and danceable riddims, steering clear of all reggae clichés, projected through a personal and truly original voice. With DJ and composer, Popa Grassie, Factor X has developed a repertoire fusing the power of ragga with the melody of roots. After appearing solo at the 2002 RAF Festival, she was invited by Omar Perry to participate in the Golden Throne competition. This earned her the opening spot for Yellowman at the VK in Molenbeek (Brussels). 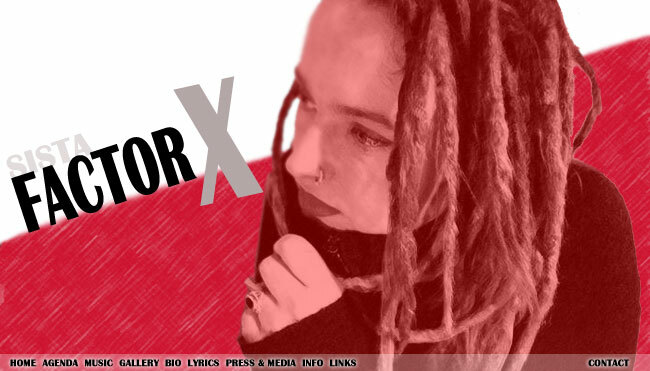 More opportunities followed and Factor X became an in-demand ambassador of Belgian reggae on projects such as the compilation albums, Reggae Demo'z and its dance-hall counterpart, Big Bang. Since her successful appearance at the Reggae Geel festival, she has also enjoyed stints as a guest singer with well-known local bands such as Panache Culture, Calabash and Deep Culcha. She has performed in both Wallonia and Flanders areas, where she has met the same enthousiasm from a warm-hearted audience. 2005 has just begun in a favorable mood as she appeared in february as the supporting act of Jamaican legend Eek-a-Mouse. Her broad repertoire and dynamic live performances have made Faxtor X what she is today: a young and powerful voice in French-speaking reggae. European, Belgian, French-speaking and conscious, she intends to stand her ground in the face of a scene predominantly black, male and English-speaking, etc.